Hungover or lazy worshippers may no longer have to get up and into their Sunday best, thanks to a new experiment in virtual sermons. 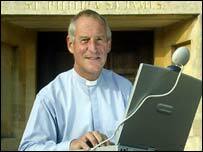 On Sunday St Philip and St James' in Bath broadcast what it described as Britain's first live service over the web. About 500 people from around the world logged on to join the 170 churchgoers making up the congregation. Members of the virtual flock even got the chance to vote online for their favourite hymn. The winner - Amazing Grace - was sung at the end of the Anglican service. The idea came from the church's Reverend Alan Bain, who approached cable company Telewest to see if they could add a "technological twist" to his Sunday service. Mr Bain said the idea was not to encourage people to stay away from church, but to reach out to those who were unable to come, or had no experience of the Church. He said a blind disabled group had already emailed him to say they were "thrilled" with the idea. The former BBC Radio Bristol presenter of religious programmes, said the project had attracted global interest, from atheists, churchgoers and religious leaders alike. "It went brilliantly," he said. "We broadcast the whole service and had about 500 hits from all over world. There's also been a great deal of local interest and we'd like to do it again if we could afford it. "As prices come down I think more and more churches will adopt the idea. I think it's a great way to communicate with people in their own homes." Mr Bain said he wanted to show that the modern Church was "vibrant, alive, radical and socially aware". "Some families have not been to church for generations. To reach them we have to go where they are, and they are on their PCs," he said. He said it was not sacrilegious to mix God with new technology and corporate sponsorship. "We get grants all the time, from all sorts of places. I see nothing wrong with being sponsored. The Church should work with anyone that supports us," he said. The church was installed with a 2Mb broadband connection so that live images could be transferred on to the web. "We hope it will be a success and that more churches will go online. This is a new path for the Church in the UK," said Mr Bain. "It may just change the way we worship in the future"